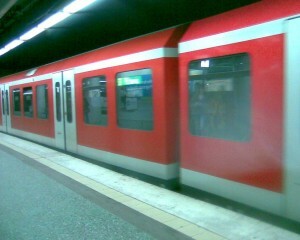 I am on the way to Altona, a district of Hamburg Germany by Metro. I am sitting at the end of the compartment on the last folding seat. From here I have a view of the window at the end of the car and towards the side window where I see the the town gliding by. Than something magical happens, which pulls me completely into its spell. Lost in thought, my eyes rest, in the corner between the windows of the train. Suddenly, I am completely awake, because I see something, which had never caught my eye before. The passing town is reflected in the back window and because of the locomotion of the train, the steadily changing pictures present an amusing optical deception. Two exactly identical worlds come together and glide silently into each other. In our normal world this would probably amount to imploding, with a loud bang or a pufff … accompanied by an immense cloud of dust. This sight touched my heart and makes me smile. This is a wonderful metaphor on several levels, which I just received as a gift. – I received this gift, because I awoke exactly at this moment. My antennae and other senses were in receipt mode. What I saw during my train journey existed only, because I drew my attention to it. I was open to this experience, otherwise this experience would not have happened to me. I have sat on the train in the same place at other times, but I did not have an experience like that spacial journey. Result: Everything that I see with my eyes only exist because of the reflection of my mind, which slides into my consciousness. If there would not be my memories, my thoughts, my feelings there would be only emptiness, at the respective moment, which is constantly refreshed any minute - a streaming in and out from moment to moment. If I view my experience focusing on the medium of “time”, the spatial time (Kairos) and linear time (Chronos) slide into each other. The linear time dissolves into the spatial time and images disappear into another space time continuum. The artificial time (Chronos) dissolves into being. This happens only if I am in the flow, then I appear to be in a bubble without time. When I look at the clock, I find out that hours have passed, although it seemed like only minutes. “Whoosh ...” I am in Altona. Now I must leave this wonderful moment behind. Such moments, I think, everybody has experienced. If I had two mirrors at some distance, and in a right angle to each other, and I walk into the corner exactly this happens. I apparently dissolve into myself. In my experience focusing on the “soul“ and the “Ego“, the Ego with all its “whys and “buts and all its judgments and damnation dissolves into the being, an emptiness and fullness at the same time is generated. It is a space of no questions and contradictions. In this space I am just being, my activities. Here follow my first impulses, not my second or third. Let us go back to my experience in the Metro. On the way back from Altona I sat down, at,the head side of the car and again allowed myself to rest without focusing,once again I could see between the windows. Fascinating, here on the head side of the car two worlds push apart. From the passing town a second town pushes out looking the same. The one seems to move slowly, while the other one becomes evident at rapid speed. Result: Depending on from which position I look at it, I leave and go into the wide world“ or „out into the wide world“. They are both one, the thought makes the difference. Our well-worn patterns of thought and position patterns make the life difficult to us. Thinking about that the question comes up: From where does the fear of receiving, this wonderful rhythm called life, come from? Things in themselves are empty. When I decide to look beyond my needs and motives (mine “why” and “but”), I change my perspectives, I can really become my true self.